This feature allows you to submit multiple timesheet submissions through Timesheet Report. 1. From your navigation bar, go to Management > Reports > Timesheet Report. 2. Click the Submit New Timesheet button located below the report filters. 3. A row will be displayed where you can input the necessary details of your timesheet. 4. 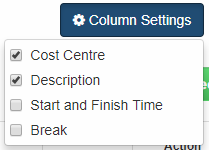 You can use the Column Settings to show or hide the columns of your timesheet. 5. Click Add if you want to fill out another row. An added row will increment the date of the current row by one day. 6. Click Delete if you want to remove the current row. 7. After filling out the row(s), click Save to successfully submit. 8. Your submission will be displayed on the timesheet report table. Note: Employees can only edit the timesheet that has been submitted. By default, timesheet is locked and can only be modified by the admin. This field is editable but by default, it is set to the current date. Only users who are given access privileges are allowed to submit timesheets of other employees. If you are inside the project, timesheet will automatically be submitted to the project you are currently in. If you are outside the project, you can change the Project Name for the timesheet using the dropdown options. The cost centre depends on your selected project. If you have not yet selected a Project Name, there will be no available options for this dropdown. If Start Time and End Time is shown on the columns, Total Hours field cannot be edited. Any changes made on the time fields will be reflected on the Total Hours field. Total Hours will only be editable if time fields are hidden.